Gondwanaland is named after the Upper Paleozoic and Mesozoic formations of the Gondwana district of central India, which display a number of shared geologic features (the "Gondwana beds"). In the late nineteenth century, on the basis of comparative geological evidence, the Austrian geologist, Edward Suess, suggested that the continents of Africa, South America, Australia and India were once part of a single supercontinent, which he called "Gondwanaland". Science tells us that the Continents of Australia, India, South America, Africa, and Antarctica, existed together as a separate landmass as long as 650 million years ago. And as these continents only began to break up some 130 million years ago, this great supercontinent had a life of around 520 million years; making it perhaps the most important geological structure of the last billion years. Throughout Gondwana's long and venerable history, the animals and plants that inhabited it were often quite different to those found in other continents. Here is a very tiny selection. Baragwanathia longifolia, one of the earliest known Land Plants, is known from the Late Silurian or early Devonian of Yea, Victoria, Australia. It is an early member of the lycopsid group Drepanophycales. The dating, on the basis of graptolites found associated with Baragwanathia, indicates a Ludlovian (late Silurian) age, predating or corresponding in age with Cooksonia, a very much more primitive ancestral vascular plant. If this date is correct it means that the late Silurian Gondwanaland flora was much more advanced than the contemporary northern hemisphere flora. (1, Eastmanosteus; 2, Latocamurus; 3. Tubonasus; 4, Incisoscutum; 5. Harrytoombsia; 6, Torosteus). Other placoderm groups are represented by the antiarch (7, Bothriolepis) and ptyctodonts (8, Campbellodus). The lobe-finned fishes are lungfishes (9, Holodipterus; 10, Griphognathus) and osteolepiformes (11, Gogonasas). Small ray-finned fishes (12, Mimia) were also fairly common. While better known dinosaurs like Apatosaurus, Stegosaurus, Triceratops, and Tyrannosaurus inhabited the northern continents, Gondwanaland was home to its own unique fauna. These evolved from a common Pangean ancestor (indeed, during the Triassic and Jurassic there was not much difference between dinosaurs in the north and south), but during the Cretaceous, as Gondwana rifted free of Laurasia, and itself in turn began breaking into the continents that are around today, the dinosaurs that lived there evolved into distinct types very different from the northern forms. 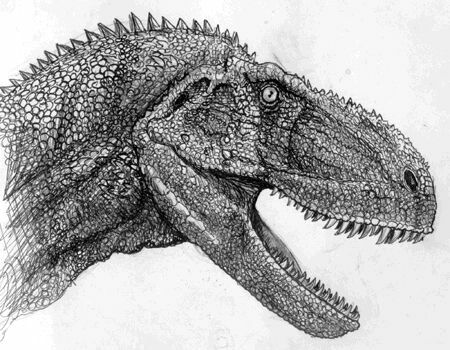 Among these were large meat-eaters known as abelisaurs, some of which had normal heads (like Abelisaurus here) and others that developed small horns. Although more "primitive" than the contemporary tyrannosaurs of Asiamerica, the abelisaurs were a very successful and widespread group that persisted throughout Gondwanaland until the end of the Cretaceous.